There was Babyface Mahoney, who made the libraries of New England his playground; the Swede; Harry Gold, whose scouts were not Baden-Powell boys yet still tied the cops into knots; "Doctor" Harold Clarke, whose Ph.D was in larceny and logorrhea; the Southerner Dupree, who'd steal almost anything; the thief known only as Paul, a nimble lifter who could jump through a library window with the loot if need be; Ben Harris, the Dane who sold illegal erotica, was savvy, fearless, and knew the score. There was Jack Brocher, who hijacked Connecticut, tipped it over, and poured its rare books into New York; Oscar the fence Chudnowsky; the shadowy master thief known as Hilderwald, Hilderman, or Hilderbrand, a literary tourist on the wrong path who checked into the Library of Congress and checked out with rarities purloined as if they were hotel toiletries and towels; and more members of the crew, desperado biblioklepts all. And then there was Charles Romm, who, with fire hydrant physique and the face and temperament of Al Capone, led this gang responsible for a five year tsunami of rare book thievery at Columbia University Library, Harvard Library, the New York Public Library, Boston Public Library, and almost every other public and private library in the Northeast, the many small town libraries easy pickin's. The books were scoured of obvious ID and then made their way to Book Row on New York City's Fourth Avenue, six long city blocks lined with the greatest concentration of secondhand book shops in the world. From Book Row the literary swag went up the food chain onto the shelves or into the back rooms of upscale rare and antiquarian booksellers in uptown Manhattan who weren't too picky about provenance, looked the other way, or were duped. The years 1926-1931 were open season for book hunters of dubious character stealing and/or dealing in hot rare books. But G. William Bergquist, Special Investigator for the NYPL with a bloodhound nose and terrier disposition, was on their trail. The beginning of the end for the outfit began with a copy of Poe's scarce Al Aaraaf, Tamerlane, and Minor Poems (1829). On Saturday, January, 10, 1931 Harry Gold sent the Southerner Dupree to the NYPL to steal the library's precious copy with the Swede and Paul as back-up in case Dupree, on his first caper, got the willies. That he did but managed to make a mad dash for the exit without slipping on the sweat flooding out of his pores and onto the floor; library staff were right behind him. But not right enough. An hour after the Southerner's close call Al Aaraaf was in Gold's hands. 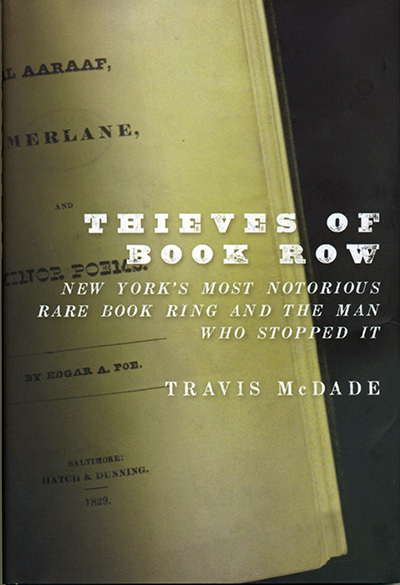 As Travis McDade, author of The Book Thief: The True Crimes of Daniel Spiegelman, and curator of rare books at the University of Illinois College of Law writes in his new book, Thieves of Book Row: New York's Most Notorious Rare Book Ring and the Man Who Stopped It, Bergquist's pursuit of Al Aaraaf (he was as anxious to retrieve it as he was to nail the perp) led to the unraveling of the Romm Gang. Significantly, the case spurred libraries across the country to beef up security, which, at the time, was, to put it delicately, in its infancy. And book theft had been, until this episode, casually treated by the police and lightly prosecuted. Book thieves were considered to be mentally ill, at the mercy of an uncontrollable passion, the "gentle madness" that Nicholas A. Basbanes has written so well about. Book thieves were finally considered to be criminals and, in New York, accommodations at Sing-Sing now awaited the convicted. As McDade makes clear in this exhaustively researched book - 185 pages of text with twenty-three pages of notes - book theft was nothing new. Its roots stretch back to the mid-nineteenth century when the first public libraries in the U.S. were established, and library theft has always attracted colorful characters. No less so were the rare and antiquarian booksellers who were actively or passively complicit in the traffic in stolen books. Those with a nose for trade history may be startled to see many familiar names from the past and learn that some of those, amongst the most respected dealers in the U.S., were not averse to acquiring books warm to the touch. The rare book trade has always been a capital-intensive, feast or famine business with even the most successful dealers often on the brink of disaster. It's a great passion but a tough way to earn a living. The temptation to acquire books at suspiciously low prices once loomed large and the quest for legitimate bargains remains an ongoing imperative. Idealists who enter the trade are soon disillusioned; purity is for Ivory soap. This is hard commerce. Thieves of Book Row, published by Oxford University Press, is a scholastic book that wants to be a popular true crime narrative and, to a large extent, it succeeds. There is rough going at first as McDade tries to wrestle the wealth of material into submission and draw us in. The sins of academic writing are difficult to exorcise but McDade, who teaches a class at University of Illinois on Rare Books, Crime & Punishment, soon loosens up, hits his stride, and the story takes off with a delightful dose of wit, a broad splash of color, and rich details and anecdotes. Example: Adolf Stager, owner, with his son, of the Cadmus Bookshop, routinely and curiously wore his hat and coat at all times while in the shop. Why? He was on disability insurance and not allowed to work so he maintained a full-time facade that he was simply visiting his son at the store in case the authorities dropped by to check on him. Bandits, rascals and rogues; good guys, scholars, and strugglers; individualists, misfits, and the melancholy: the rare book trade's personnel department never has to recruit, we just show up. The feral bandits have been tamed, if not domesticated, since trade associations emerged in the mid-20th century and established codes of ethics, which even non-association members tend to follow; it's just good business. The fact that book theft is now considered a serious crime with serious consequences has tempered the temptation for stealer and receiving dealer alike. The overwhelming number of rare and antiquarian booksellers are on the square and perhaps the worst that can be said about a dealer's behavior reiterates Chico Marx's reply in A Day At The Races when Groucho asks if he can trust Harpo. "Sure, he's honest," Chico says, "but you gotta watch him a little." I love the trade and our cast of characters. And I loved this book, a chronicle of Booktown's Depression-era mean streets when literary culture met organized crime. McDADE, Travis. Thieves of Book Row. New York's Notorious Rare Book Ring and the Man Who Stopped It. New York: Oxford University Press, (June) 2013. First edition. Octavo. xi, , 216 pp. Black cloth, gilt-lettered spine. Dust jacket. $27.95. Pablo Escobar: Drug Lord & Book Publisher?